The house is already run as a family business in the fourth generation and has gained in coziness and flair through various rebuilding phases. Our motto for the guest is, besides friendliness and cordiality, to offer a familiar and family atmosphere. Schwanberg has been a popular summer-resort in the Schilcherland region for decades. It is also an ideal starting point for your cycling tour through the beautiful landscape of the West and South Styria. The various hiking trails, hiking trails and Nordic walking trails in and around Schwanberg with the most diverse levels of difficulty invite you to take part. Furthermore, Schwanberg has many facilities for modern holiday and recreation. Let yourself be enchanted by the hospitality of the Weststeiers and enjoy the delicacies of the region. 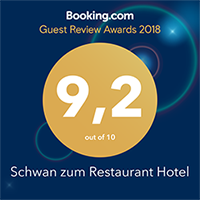 Room free in "Zum Schwan" in Schwanberg (Styria)?